Last Saturday, my boyfriend Kristoffer and I visited the Temecula Farmer’s Market in old town to buy fresh ingredients for dinner. I was thrilled to see that our farmer’s market is now offering even more selections, including sustainable seafood, grass fed beef, quail, squab, fresh baked bread and microgreens. Their seasonal produce selections are endless and the food vendors are out of this world! During our shopping session, we found pupusas, tamales, gyros, baja fish tacos, fresh jams and delicious jellies. After visiting some of our favorite vendors, we stopped at a produce stand called Tule Peak Farms to grab some microgreens. They had an amazing selection of produce and herbs, everything from pea shoots and micro sunflowers to lemon verbena, a great herb for imparting intense lemon flavor into a dish. Lemon verbena is a great substitute for lemon grass and the perfect addition to a piping hot glass of tea. I was immediately inspired to add it to my seafood ceviche and Kris said he would mix up a delicious gin cocktail to pair with the dish. As you know, gin and tonic is my go-to summer drink this year, because it’s so refreshing. I was stoked that our dinner was coming together right before my eyes! We also bought some fresh, wild tuna at the little stand called Dry Dock Fisheries. They had a great selection of everything, including sea scallops, salmon and a variety of fresh fish caught that morning. By the time we arrived, much of their product was gone and some of the vendors were already wrapping up. Most people had arrived early to beat the hot weather. We started shopping at 11 am, and by then, it was already 90°F degrees. Thankfully, the booth attendant was kind enough to wrap our fish in ice and hold it while we continued our shopping. The thing is, Kris and I get so busy, that we both really appreciate just having a moment to hold hands and explore the farmer’s market for inspiration. Yeah, my mascara was running down my face and my hair was like the bride of Frankenstein, but the experience made the unbearable heat all worth it. Visiting your farmer’s market is not only a great to support your local farmers, but also a great way to spend quality time with someone you love. There is so much to see, taste and overall, a wonderul farm-to-market experience to enjoy. Want to try Kris’ Lemon Cucumber Gin & Tonic Cocktail for yourself? 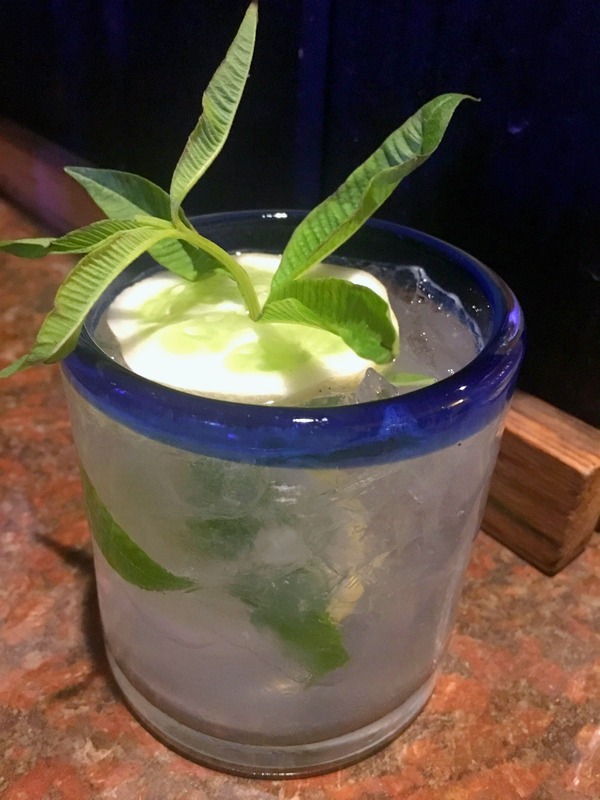 Grab some lemon verbena from your local farmers market and make yourself refreshing, chilled cocktail. The perfect drink on a hot summer day! Provecho! This refreshing Lemon Cucumber Cocktail is the perfect cool drink for Summer! In shaker muddle 3-4 lemon verbena leaves. and 1 lemon cucumber wheel with .25 ounces of lemon juice. Empty into chilled rocks glass fill with ice. Add 1.5 oz Bombay Sapphire top with tonic and stir to chill. Garnish with cucumber wheel and lemon verbena leaves.